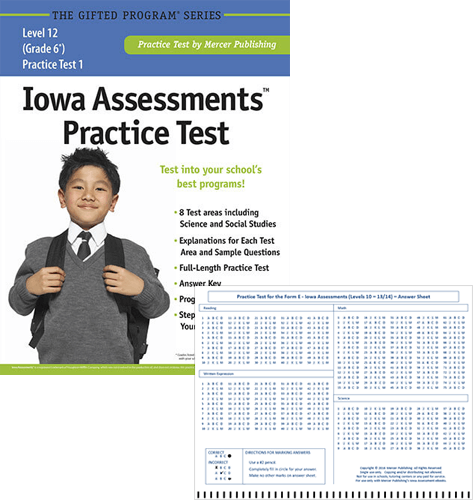 The Iowa Assessments Study Package is designed to give each student everything they will need to achieve their highest potential on the exam, including 1 full-length practice test and a bubble sheet answer form. A single full-length practice test, with the same number of questions as the Iowa Assessmentsq Level 12 exam. Level 12 is the Iowa Assessments version of the test given to children in Grade 6. Each practice test is in the same format as the actual exam. Each book contains a single full-length practice test with eight subtests including Science and Social Studies. The object of these practice test is to familiarize your child with the questions they will face on test day, how the tests are formatted, the symbols used and the number of questions in each test area. However, since this practice test has not been standardized with Houghton Mifflin Harcourt and the actual Iowa Assessments test, a valid Iowa Assessments test score cannot be concluded from their results on these practice tests. q Iowa Assessments is a trademark of Houghton Mifflin Company. Houghton Mifflin Company was not involved in the production of, nor endorses, this practice test.